LEARN THE TOOLS OF THE TRADE!!! Go to seminars, go online, and take classes on reading. Understanding reading will help you spot issues when advocating for your clients. Two great publications are: Put Reading First: Kindergarten through Grade 3, and Put Reading First: Helping Your Child Learn To Read: A Parent Guide: Preschool Through Grade 3. Get these free publications at https://www.edpubs.gov/. Understand the qualifications and recommendations of the National Reading Panel. Learn more at https://www.nichd.nih.gov/research/supported/Pages/nrp.aspx. If your client is not a proficient reader, ask the parents to request a comprehensive reading evaluation, performed by a qualified reading specialist. Forge strong relationships with reading specialists in your state. The input of friends and colleagues who are reading experts can be invaluable to preparing for IEP meetings. Grow the local reading specialists. Most of them live in the “LD world.” Help them understand that students with intellectual disabilities or autism can become proficient decoders. Request an assistive technology (AT) evaluation to see if there are high, mid, or low level AT options that complement the client’s reading program and increases access to content. Remember that decoding is very distinct from comprehension. Comprehension is more closely tied to intellectual challenges; decoding ability is usually relatively independent of IQ measures. Do NOT assume that Special Education Teachers are qualified to do reading evaluations or teach reading. In many states, a highly qualified Master level special education teacher does NOT have to take any reading classes! Ask for the resume of anyone doing a reading evaluation on your student. Do not assume the “Literacy Coach” or special education teacher has credentials. If a teacher claims to be “trained” in Wilson, find out if s/he went to the 5 hour class – which essentially shows you how to use the materials – or completed the requirements to achieve certification. Similarly, a teacher cannot claim to be “Orton-Gillingham trained” unless s/he has achieved certification at the Certified level – a multi-year commitment. 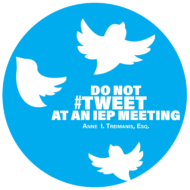 Attorney Treimanis, author of “Do Not Tweet at an IEP Meeting” has represented students with disabilities for 30 years. Her own daughter with Down syndrome is a proficient reader. Meet Attorney Treimanis at http://spedlawyers.com.